We stand under the surveillance / cameras with a starved look, but will not eat. Jelenkor is one of the most prestigious literary journals in Hungary. As often happens with small languages, literary prestige does not quite translate to a very wide reach: apart from the print version, Jelenkor‘s poems and short stories are read by a few hundred people at best. As the end of 2017 was approaching, journalist Péter Urfi set out to find the closest Hungarian equivalent to the success of “Cat Person,” Kristen Roupenian’s short story that took the internet by surprise. To Urfi’s astonishment, the winner was not only a poem instead of prose, it was not written by a writer with a significant online presence. 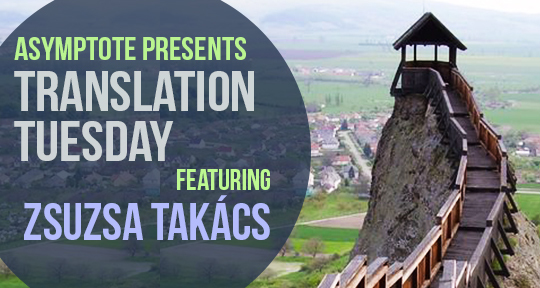 It was Zsuzsa Takács’s “Provided we have a soul,” published in Jelenkor. More than 70,000 people read the poem and over 1,200 liked it without any significant publicity effort. The humanism, measured dignity, and accuracy of the poem might account for some of this popularity. It also speaks of the frustration many feel at the gradual, relentless dismantling of democratic institutions in the country, at once experiencing it and able to adopt the slight condescension of the token catastrophe tourist. Ultimately it is not incredibly important to pin down the reasons, as resonance is an elusive matter. The sheer power of the poem shall speak for itself. He’s not known to have one shape. That’s the rub. a soul, and are not copulating animals only.